Poker players often times overlook bet sizing. They learn early on that a 2/3 pot-sized bet is standard, and for the rest of time they bet 1/2-3/4 pot in most situations. But there are many times when a different bet sizing strategy would prove to be much more profitable. In this video I show how bet sizes influence final pot sizes, and how little improvements can add up in a big way. Read on below if you want to follow along with the script, and the link to the free spreadsheet is down there as well. Enjoy! Hello, and welcome to today’s Quick Plays video on Pot Geometry. Understanding this concept can help you choose better value bet sizes in real-time, which can crucially influence your winrate. In this video I’ll show you what pot geometry is, why small changes can make a big impact, and how to use our spreadsheet to practice this on your own. 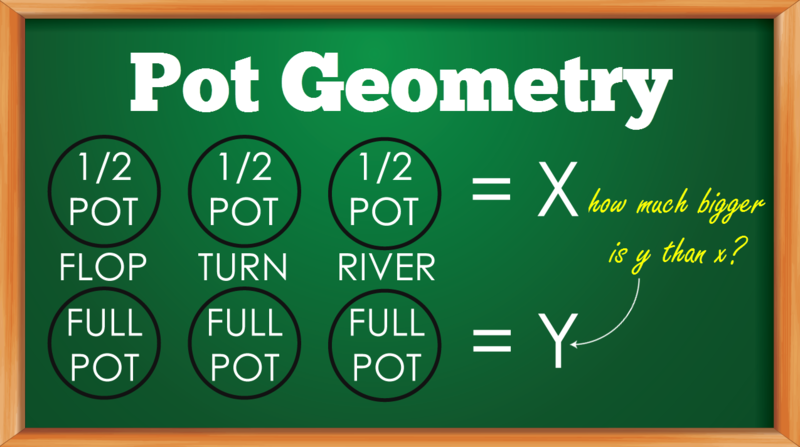 First, what is pot geometry? Pot geometry looks at what every dollar put into, or not put into the pot does to the final pot size. It’s easy to understand that if we were to bet half pot on every street the final pot size would be different than if we would have bet full pot on every street. But how big of a difference is it really? In the second rendition we bet a traditional 2/3 pot on each street. Notice when we get called down the final pot size is now $96. In this final rendition we bet full pot on each street. Now if villain calls us down we are actually all in on the river. Three slightly different sizes, but they result in very different final pot sizes. This can be the difference between winning a decent pot and winning that home run pot! The largest influencer of each example was the river bet size, which is usually going to be between 50% and 100% of the pot size on the river. If the pot on the river is very small it’s going to be tough to make a big bet that isn’t outlandish given the pot size. Betting $100 on the river is going to raise many more eyebrows if the pot size is $20 versus $150. So choosing correct sizes on the Flop and Turn is important to ensure the pot size on the river is large enough to make a reasonable value bet. Understanding the correlation between half, full and 2/3 pot bet sizes and the final pot is great. But what about the other bet sizes like ¾? Or what if you bet 2/3 on the flop and then full pot on the turn? Well because today is your lucky day you can use our free tool for further exploration! You can download this tool from ThePokerBank.com > Tools > Poker Spreadsheets. But once you get it downloaded you can have a lot of fun by plugging in some simple numbers and seeing how things change. Basically you get a few things in this spreadsheet. You can plug in some simple numbers like effective stack sizes and bet size percentage per street to then visualize everything in the graph on the right. The graph shows you the effective stack sizes starting each street in blue, The pot size in green, and the bet size in gold. Notice how if we change any number that you get immediate visual feedback from the graph. Now I want to show you this tool for two reasons. First, is that you should experiment a bit and see how things change when you alter your size per street. Notice what the final pot size is and how little changes can drastically alter how much you can win. Remember when you are playing with this that everything is in percentages or big blinds…not dollar amounts. The second reason why I wanted to bring up this tool is to highlight a difference between live and online poker. In online poker it’s very standard to open to 3x the big blind. So if we plug in 3 as the preflop raise size and use 75% for all 3 streets we see the final pot size is roughly 117. But live poker is different and the open raise sizes tend to be larger, especially at $1/$2 and $1/$3. So if we change the preflop raise size to 5 and keep a 75% bet on all streets notice that the final pot size is roughly 180. Just a small change in the preflop raise size can create a vastly different final pot size. Now a smart player is going to use this to their advantage. They will consider the pot size they want to make against their opponent and they choose the correct sizing strategy. If you flop a huge hand against a bad opponent you likely want to veer away from making a “standard 2/3 pot sized bet” and instead make a full pot sized bet to get his stack on the river! That is pot geometry in a nutshell. Think about what every big blind you put into the pot will do to the final pot size. New players get so focused on always making the same bet size, and in doing so miss out on huge value from bad players who will gladly call half pot as often as they’d call full pot. Never choose a size JUST because it’s your default size…make sure your bet sizes are appropriately made for your pot size goals against your particular opponent!